Innovative research investigating X-ray absorption spectroscopy (XAS) methods for memory applications has been deemed as a showcase study at one of the UK’s top science facilities. A team of researchers from the University of Southampton and University of Kent have analyzed the role of titanium dioxide thin films in emerging memory devices using Diamond Light Source, the Oxfordshire-based UK’s national synchrotron facility. Diamond works like a massive microscope, driving electrons to generate bright light that scientists can apply to explore anything from viruses and vaccines to fossils and jet engines. The research was guided by the Prodromakis team in the Department of Electronics and Computer Science (ECS) that is recognized as world-leading in the emerging area of memristive devices and their applications in microelectronics. The research has been enabled by flexible testing platforms being developed by the team’s start-up ArC Instruments Ltd that in this case was used for decoding the switching mechanisms behind memristive devices. 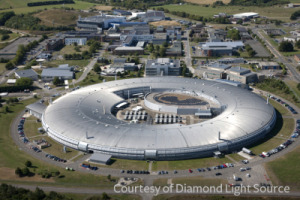 Diamond Light Source is showcasing the titanium films research as a leading case study via its Industrial Liaison Office.